This past weekend the English filmmaker Ad Lane spent 60 hours tweeting live in front of a camera via streaming. The action was part of a campaign that Lane performed with the intention of raising funds to shoot his first film, "Invasion of the not quite dead," thanks to the fan donations. The filmmaker's followers were quick to recognize his effort and recommended his account @indywoodFILMS using the hashtag #followfriday, positioning it in the number 6 of the global ranking (with 8877 points). The profile has won the 1st place in the UK ranking! According to Ad Lane’s website, he has the world record for the longest time tweeting without sleep: 86 hours! 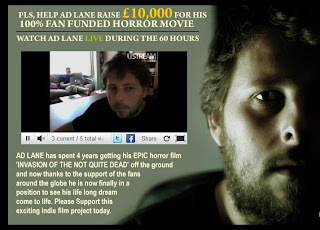 Since the beginning of his campaign on Twitter, in 2009, the filmmaker has raised over £40,000, “showing that fans (from 26 different countries) can bring as independent horror movie to life”. Awesome! With the money, Lane could shoot the first part of "Invasion of the not quite dead" in Bulgaria (watch the teaser below). All FollowFriday team wish to Ad Lane good luck in the second half of the filming! Congratulations to @thalia’s and @uk_johnjames_oz’s fans for the reviews they have done! Your blog can be motivational as well inspiritional for many. For best fundraising campaign it can be discussed. Givetaxfree.org helps donars and receipants by making donations taxfree. Wao man! You did awesome work as you stay online this much long time. This site blogs are awesome as they always motivate me whenever I visited here an read blog. Blog is a short type of weblog. It very well may be characterized as an instructive or talk stage in the World Wide Web comprising of posts which are discrete sections entered in a sequentially turn around way.